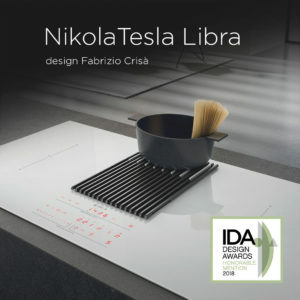 Elica received two IDA Design Awards for NikolaTesla Libra and NikolaTesla Flame. Both products were designed by Fabrizio Crisà for Elica and won in the subcategory “Home Interior Products – Kitchen Appliances”. NikolaTesla Libra had an Honorable Mention, while NikolaTesla Flame a Silver Award. In the previous edition, Elica’s NikolaTesla Switch was a Gold winner as well as Lullaby which was also Product of the Year, and Haiku was a Bronze winner.